THE PRODIGAL SON RETURNS: After learning that his father, Bishop Taylor is dying from cancer, teen music idol David Taylor (Boris Kodjoe, center) rethinks his earlier errant ways and returns home to settle down and take over his father's pulpit. It should come as no surprise that faith-based films would appear in the wake of Mel Gibson’s The Passion of the Christ. But what couldn’t have been predicted, is that a major Hollywood studio would create a wholesome, Christian-oriented, family picture as engaging and entertaining as The Gospel. Inspired by the parable of the Prodigal Son, Luke 15: 11-32, the movie was written and directed by Rob Hardy. The Gospel is set in present-day Atlanta, and features a cast headed by Boris Kodjoe as David Taylor, the son of the much-beloved pastor Bishop Taylor (Clifton Powell) of the New Revelations Baptist Church. With the help of the choir, Bishop Taylor has managed for years to bring his congregation to its feet Sunday mornings. Although David had once envisioned following in his father’s footsteps, he abandoned the spiritual path for a secular one and instead, became a star pop singer. 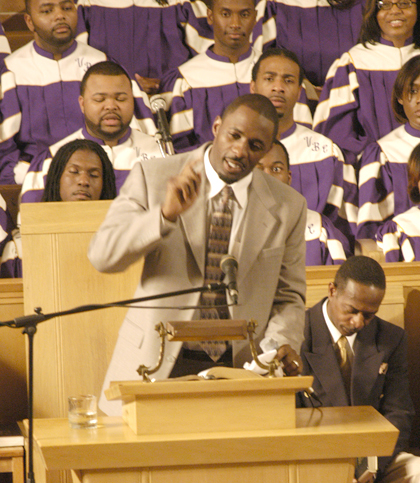 Meanwhile, his childhood friend Frank (Idris Elba) became the heir apparent to Bishop Taylor's pulpit. Frank is an ordained minister and has married David’s cousin, Charlene (Nona Gaye). However, her infertility and his aspirations to become a televangelist by turning her uncle’s fledging church into a media empire, have led to marital problems. Bishop Taylor is stricken with cancer and has little time to get his affairs in order. When David learns that his father is terminally ill, he puts plans for his next concert tour on hold and returns home to take care of his father. Though he had been living life in the fast lane, this return to his roots causes the superstar to rethink the many selfish and materialistic choices he has made. He even thinks of settling down, with Rain (Tamyra Gray), a single mother raising a five year-old child (China Anne McClain). While The Gospel introduces more characters than necessary to deliver its message about the importance of faith and family, its salient points get delivered despite the many subplots. However, the best reason to recommend this movie might be its soundtrack, which is guaranteed to have persons of any faith swaying in their seats. The music was arranged by Kirk Franklin and woven into the story by including well known gospel singers into the cast, such as Yolanda Adams, Fred Hammond, Donnie McClurkin, and Martha Munizzi. Expect to dab away a few tears as you dance up the aisle. Excellent (3.5 stars). Rated PG for adult themes, suggestive material, and mild epithets. Running time: 98 minutes. Distributor: Columbia TriStar.